Council Bluffs, Iowa - Big Lake Park - July 7, 1974: My girlfriend an I were camping in the backyard in the west end of Council Bluffs,IA. I noticed an object high in the sky traveling from horizon to horizon like a satellite except it was red and traveling somewhat faster and moving side to side in a wave motion, not a fixed pattern but not exactly random either. It went much slower than a meteor. We stood up from our cots to better watch the skies; a short time later we saw a disc shaped object with red lights on its perimeter from a distance of about two miles. it seemed to be moving above the trees near the Missouri river or following the river itself. not quite hovering, but moving slowly while tipping on its sides and demonstrating to us that this was something very unusual. We watched it head south until we lost it below the trees. We stayed alert and debated if we should go to Lewis and Clark monument, a park on the bluffs overlooking C.B and Omaha. About 5 or 10 minutes after last seeing the object, it flew almost directly over our heads, about a block away, now going north and still just above treetop level. we lost site of it and decided to go ahead and drive to the park. On the way we were driving through Big Lake park and I was keeping watch. I saw the object coming in our direction, still at treetop level, except I had the eerie feeling that it was coming for us. We panicked. I wanted to hide under the train bridge near the tennis court and my girlfriend stopped the car about 50 yards short of the bridge. we ran to and under the bridge to hide. I've never experienced that kind of fear before or since, but, like a couple of prairie dogs we felt compelled to peek out and see more of this incredible object–so we did. 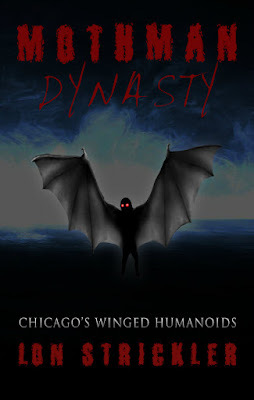 It was hovering above a large cottonwood tree near the tennis court about 50 to 75 yards away from us. It was still dark out. 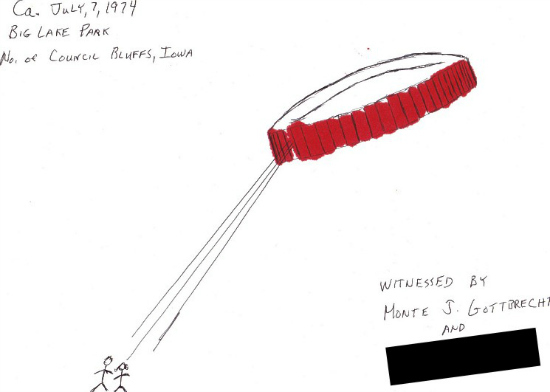 The disc looked about 100 feet in diameter with large red rectangular lights flashing in sequence around its edge which seemed to be about 15 feet thick. As we watched, frozen with awe and fear it dipped its edge while hovering. one of the red light went out and in its place a beam of light shot out of it and shined directly at us. The next thing either of us remember is that it was now daylight and we were back in the car driving towards our original destination of Lewis and Clark monument. We called police and they said they had a report of something in Missouri Valley, IA, about 20 miles to the north. Animals were behaving strangely; either they were oddly quiet or behaving wildly. When we drove back through Big Lake Park there were people there who said they saw nothing. I don't really know how much time we are talking about here. In 1974 I had never heard of the phenomenon of "missing time", but over the years I became well schooled with the term. We make no claims of abduction. Dr. kasher of Univ. of Nebraska at Omaha, after hearing my story referred me to a hypnotist. I never went ... maybe out of fear. I was afraid to know anymore. To this day I feel I know enough. My girlfriend and I went home that morning and drew identical pictures and repeated identical stories. I've had no credibility ever since. You have to understand at the time I thought the world was coming to an end or something. In 1977 an article came out in popular mechanics about an incident that happened very near there involving a blob of molten metal falling 500 feet from an object similar in description to what we saw. Jacqes Vallee came to investigate that occurrence. That is why I repeat my story and will always harbor these hazy memories and questions. In 2001 I filed a report with NICAP, but I know that MUFON is the proper agency for that now. I've never seen or experienced anything like that since. but I feel it in my gut every day. Strong tremors have struck near Guam, Japan and Alaska within the Pacific plate as fears of Ring of Fire activity return. The US island territory of Guam was struck by four earthquakes in the early hours of Tuesday as magnitude 5.7, 5.6, 5.4 and 4.9 quakes shook the region. The earthquake activity returns after a magnitude six quakes struck 10km deep off the Northern Mariana Islands. No immediate tsunami warning was triggered. It’s already been shared more than 4600 times and has racked up 300,000 views. More than 2500 social media users also commented on the video, many of which expressed concern about how close the wild pigs were to the school.